It’s pumpkin season and I couldn’t resist buying my favorite Sugar Pie Pumpkins from the store. They are small, easy to use and sweeter than larger pumpkins which make them perfect for baking! Speaking of baking, this time I made a no-bake pumpkin dessert made with mostly raw ingredients. This was my first time using raw pumpkin and it was super easy! All you do is peel the pumpkin, cube and pulse in a food processor until the texture is very fine. In this recipe, the pumpkin is incorporated with the remaining filling ingredients in a powerful blender (Vitamix recommended) and blended to a creamy, smooth consistency. All you need is one cup of grated pumpkin, so one small Sugar Pie Pumpkin will be plenty and you will still have leftovers for another use. You will be amazed at how delicious this dessert is even though it contains no sugar, butter or flour. The sweetness comes from honey, dates, coconut oil, and oranges. Your gluten free and paleo friends will love it and your dairy-free friends will be so excited since they can substitute the milk for nut milk or water. Overall, it’s a very satisfying dessert that everyone will love, especially since it’s full of nutritional value. Be sure to store them in the freezer and serve them cold for the best consistency. Happy Fall and stay tuned for more pumpkin desserts coming soon! 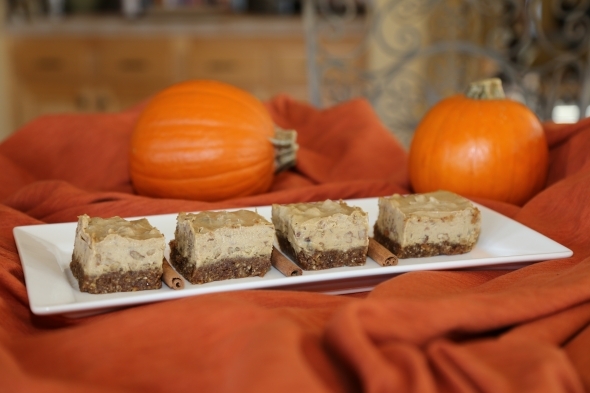 Welcome the flavors of the Fall Season with these scrumptious gluten free, no-bake bars! Prepare Crust: Place pecans, cinnamon, sea salt and dates in a food processor and pulse until almost finely ground. Test the crust by spooning a small amount and rolling into a ball in your hands. The mixture should stick. If it does not pulse a bit longer or add more dates. Scoop out mixture and evenly press into a 9x9x2 inch baking pan, pressing firmly and making sure the edges are well packed. Cover and place in the freezer while you prepare the filling. Prepare Filling: Place orange juice, cashews, grated pumpkin, melted coconut oil, (this can be done in a saucepan on very low heat) milk, honey, vanilla bean seeds and pumpkin spice in powerful blender and blend until very smooth. If needed, add additional orange juice for a thinner and smoother consistency. Mix in 2 cups chopped pecans and pour onto crust. Smooth top with a spatula. Cover tightly with plastic wrap then foil and freeze until solid. Remove from freezer and thaw for about 10 minutes (this will making slicing easier). Run a smooth, sharp knife under hot water then run the knife around the edges of the pan and cut into squares. Serve immediately or transfer the bars to an airtight container and store in the freezer until ready to serve. * Prepare pumpkin by peeling, cubing then grating in a food processor until very fine.